The Sooty Tern breeds often in great colonies on remote rocky islands and reefs. One of its regular breeding-places is the small rocky island of Moto Nui, lying off the S.W. end of Easter Island close to the crater of Rano Kao. In this post is described the great annual ceremony which was observed by the Easter Islanders, in which the main feature was a competition to secure the first egg of the season after the arrival of the terns at their nesting site, and how the lucky winner in the race became the Bird-man of the year. He enjoyed certain privileges combined with some discomfort due to his being placed under a rigid tahu, a set of tribe regulations. The sacred egg was preserved in his house until the next season. The privilege of obtaining the first egg was a matter of competition between members of the Mata-toa, but the right to be one of the competitors was secured only by supernatural means. An ” iviatua,” a divinely-gifted individual, dreamed that a certain man was favoured by the gods, so that if he entered for the race he would be a winner, or, in technical parlance, become a bird-man or ” tangata manu” ; it was also ordained that he should then take a new name, and this bird-name was given to the year in which victory was achieved, thus forming an easily remembered system of chronology. The nomination might be taken up at once or not for many years ; and if not used by the original nominee it might descend to his son or grandson. Women were never nominated, but the iviatua might be male or female and, needless to say, was rewarded with presents of food. Those men going to take the eggs were men of importance and spent their time with the rest of the Ao at the village of Orongo ; they selected servants to represent them and await the coming of the birds in less comfortable quarters in the islet below. The selected men, who were known as ” hopu,” went to the islet when the Ao went up to Orongo or possibly rather later. Each made up his provisions into a pora, a securely bound bundle of reeds, he then swam on the top of the packet, holding it with one arm and propelling himself with the remaining arm and both legs. The islet of Motu Nui is, as its name signifies, the largest, and is also the outermost of the three islets which lie off the coast of Rano Kao. It can only be reached in fine weather, and even then it is no easy matter to gain the particular ledge of rock where landing has to be made on the crest of a wave before the sea again retreats boiling and surging many feet below. Once landed, however, the surface is comparatively level and presents no difficulties. It is about five acres in extent and is covered by coarse grass which almost conceals the entrance to the cave in which the hopu lived while awaiting the coming of the birds . As bad weather might prevent fresh consignments of food during the weeks of waiting, the men carefully dried on the rocks the skins of the bananas and potatoes which they had brought with them. 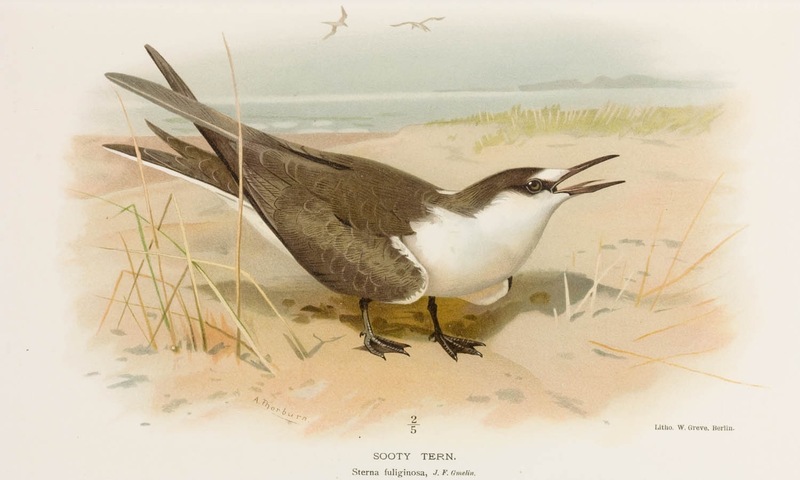 It is worth noting that the coming of the tara, which is a species of tern, inaugurates the deep-sea fishing season; till their arrival all fish living in twenty or thirty fathoms were considered poisonous. The birds arrived in September and on first alighting tarried only a short time; immediately on their departure the hopu rushed out to find the first egg. The first finder rushed up to the highest point of the islet calling to his employer by name, ” Shave your head, you have got the egg.” The cry was taken up by the watchers in the cave on the mainland, and the fortunate victor, beside himself with joy, proceeded to shave his head and paint it red, while the losers showed their grief unrestrainedly. The defeated hopu started at once to swim to the shore, while the winner, who was obliged to fast while the egg was in his possession, put it in a little basket, and going down to the landing rock dipped it into the sea; the significance of the word hopu is ” wash.” He then tied the basket round his forehead and was able to swim quickly, as the gods were with him. When the hopu arrived on the mainland he handed over the egg to his employer. The bird-man, having obtained the egg, took it in his hand, palm upwards, on a piece of tappa and danced with a rejoicing company down the slope of Rano Kao and along the southern coast. This procedure, which is known as ” haka epa,” or ” make shelf,” from the position of the hand with regard to the egg, was continued till the party reached Rano Raraku. Legend relates that the manu-tara were not originally on Motu Nui. They lived, it is said, at one time, on a rock off the east end of the island, but every one came and ate them, so Hawa and Make-make sent them to a place on the mainland on the south coast, but still every one ate them; then they went up to the top of Rano Kao on the opposite side of the crater from Orongo and here was held the first festival; finally the birds went to Motu Nui. Folklore Society (Great Britain). ‘Folklore, 28.’ London, Folk-lore Society.